THIS ITEM IS NOT AVAILABLE AT PRESENT. WE WILL NOT BE GETTING ANYMORE Star Wars 2 Sided Shoretrooper Rebel Tote Bag. From the Star Wars Rogue One collection by Loungefly. 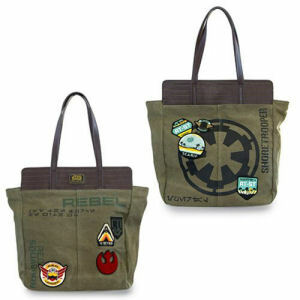 Star Wars 2 Sided Shoretrooper Rebel Tote Bag. This Cotton twill and faux leather tote bag measures 13.25 inches wide by 15.75 inches tall by 5 inches deep. All Loungefly items are vegan friendly - unless otherwise noted.